Blue Dot allows you to control your Raspberry Pi projects wirelessly - it’s a Bluetooth remote and zero boiler plate (super simple to use :) Python library. Created by Martin O’Hanlon (@martinohanlon, stuffaboutco.de). See the getting started guide to ‘get statred’! The Blue Dot is a joystick as well as button. You can tell if the dot was pressed in the middle, on the top, bottom, left or right. You can easily create a BlueDot controlled Robot. Why be restricted by such vague positions like top and bottom though: you can get the exact (x, y) position or even the angle and distance from centre where the dot was pressed. Its not all about when the button was pressed either - pressed, released or moved they all work. 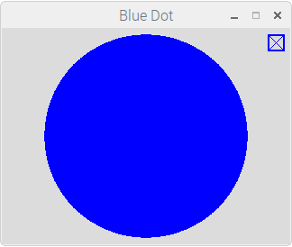 The dot doesn’t have to be blue, or a dot, you can change its colour, make it square or give it a border. You can press it, slide it, swipe it, rotate it - one blue circle can do a lot! The online documentation describes how to use Blue Dot and the Python library including Recipes and ideas. Production - under active development. Be sure to raise an issue if you have a feature request or experience problems.